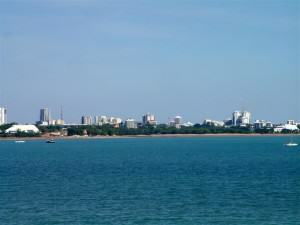 Darwin is hot and humid for most of the year. And so it was when we arrived one afternoon in early autumn. To the locals I imagine it was a pretty normal day, to those of us from way down south it was just hot! We’d been travelling since about 9:00 that morning and already by that time the temperature was moving upwards at a pretty steep rate. About an hour after starting out we noticed a sign to Edith Falls, also known as Leliyn. Everyone we’d spoken to had told us that this was one place we really had to see and, looking for a place to stop for coffee, we decided to see what all the excitement was about. Well, those people were right to be excited, it was absolutely beautiful. Edith Falls is part of the Nitmiluk National Park and is approximately 61 kilometres (38 miles) north of the town of Katherine. There are a variety of walking tracks, including the Leliyn Trail which is a 2.6 kilometre (1.6 miles) round trip that climbs to the top of the escarpment and then down to the upper pools. We’ve been told that the walk offers fantastic views over the waterfalls and the Edith River. There is a longer walk of 8.6 kilometres (5½ miles) that will take you to Sweetwater Pool, a secluded swimming hole on the Edith River. A little pressed for time, we took the path down to the lower falls and rockpool, a walk of a mere 150 metres (492 feet). 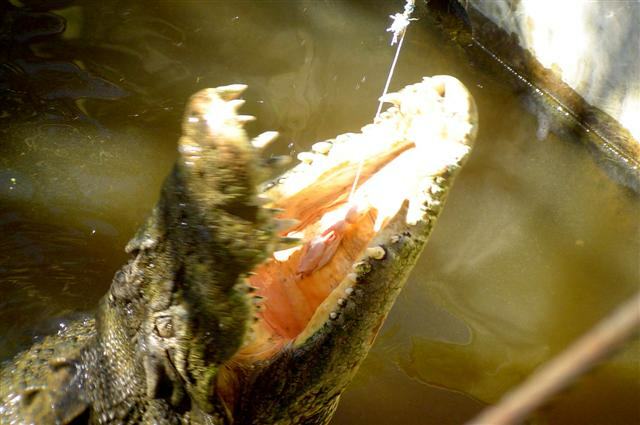 There was a warning sign about crocodiles; the pool is closed between 7pm and 7am because the freshwater crocodiles come to feed and frequently their saltwater cousins come in undetected. Swim at your own risk, the sign said. Charming! My question was, since when did crocodiles learn to tell the time? There were some folks in the water and it looked very inviting but no thanks! What’s that old saying about “Come into my parlour said the spider to the fly”? We made Adelaide River by lunch time and decided that this was as good a place as any to stop for a bite to eat. 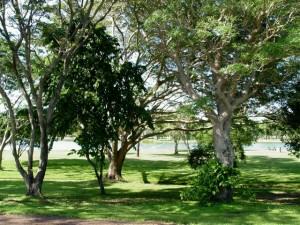 Located 203 kilometres (126 miles) north of Katherine, this pretty riverside town backs on to the river of the same name. In 1871, the discovery of gold at Pine Creek made Adelaide River a popular stopover for prospectors enroute to the gold fields. Today, it holds the distinction of having the only turf racetrack in the entire Northern Territory and is the site of the third-largest war cemetery in Australia. We decided that a few days here on our next trip might be very interesting but this time it wasn’t on the agenda. returning with our shopping that my prayers were answered and it started to rain. It was a quick, heavy shower and when it was over the humidity returned with a vengeance! But we took our bottle of Two Tails Sparkling Wine and headed for the pool where we toasted our arrival in Darwin. metropolis and on the other it maintains a fabulous laidback lifestyle. 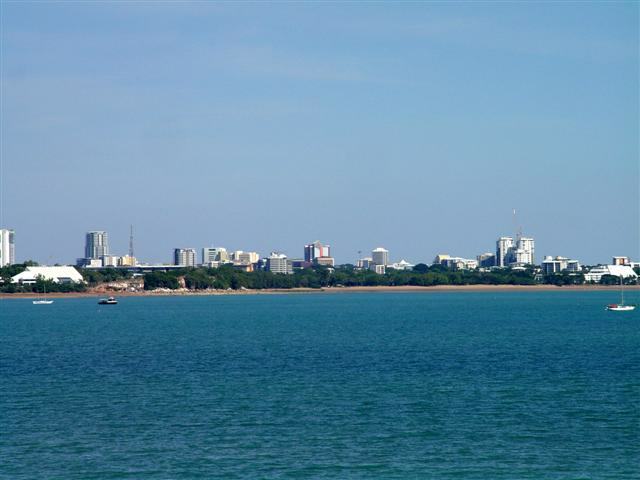 Rebuilt from the devastation of World War II bombing and the fury of Cyclone Tracy, Darwin is the gateway to some of the world’s most spectacular scenery. For our first full day here we strolled around Darwin City and wandered in and out of a myriad of shops, both big and small, in the Mall. There were shops selling local Indigenous arts and craft as well as basic souvenirs and by the time we stopped at a little café for lunch our wallets were considerably lighter than when we’d started out this morning and we’d certainly given Darwin’s economy a boost! 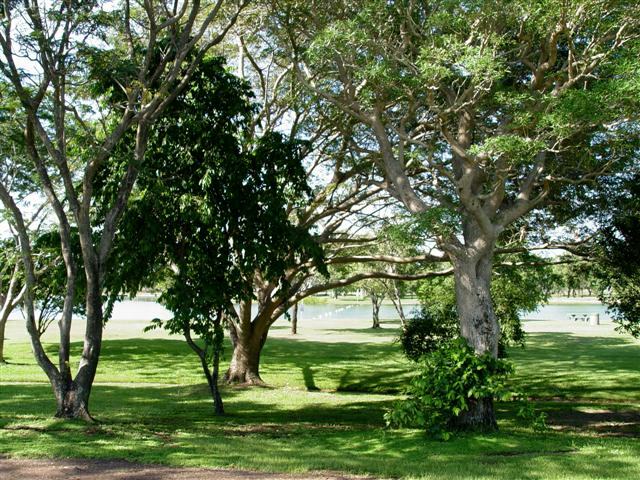 We wandered along the Esplanade and into Bicentennial Park, a beautiful expanse of green grass, shady trees, spectacular flowers in bloom, and walking paths overlooking the stunning blue waters of Darwin Harbour. Under a cloudless blue sky this is the kind of place where you could simply sit and relax without a care in the world. The USS Peary Memorial is located here in Bicentennial Park. 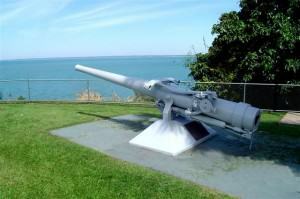 This memorial is actually one of the guns from the only American naval vessel sunk in Darwin Harbour during World War II. The gun was salvaged from the wreck that still lies at the bottom of the harbour and it is positioned so that it points to the location of the Peary. The memorial is dedicated to the officers and crew who lost their lives in the first Japanese air attack in 1942. Also honoured is a United States Army Air Force pilot, Lt Robert Buel, who lost his life in a heroic attack on the enemy aircraft. Also in the park is a memorial to Ludwig Leichhardt, the naturalist and explorer, who, along with a party of path­finders, left Brisbane in 1845 and reached Port Essington on the Coburg Peninsula, a remote wilderness area on the north-west tip of Arnhem Land, on December 17 of the same year. They had travelled 4800 kilometres (2982 miles) and this was Leichhardt’s finest achievement. property was sold and in 1984 the Museums & Art Galleries Board developed it as a museum of early Darwin history. By now I was ready to move on to somewhere a little cooler; the day wasn’t just warm, it was scorching. 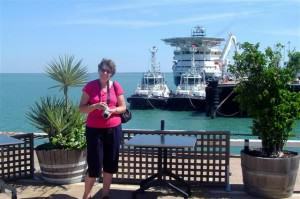 And so, at John’s suggestion, we made our way down to the Darwin Wharf Precinct at Port Darwin. There were boats, and some more boats, and just for something different, a few more boats. John was in heaven! The Paspaley 4, one of the mother ships of Paspaley Pearls, was docked at the wharf. What a truly magnificent boat! Custom built in Norway, she is 52 metres (171 feet) in length and carries a permanent crew of 55. John was completely mesmerised as he gazed in awe at her gleaming white hull and sleek, clean lines. It was all I could do to drag him away but it was when I said I needed his credit card that I got his full attention! The Australian Pearling Exhibition offers a fascinating insight into the pearling industry in Northern Australian waters. It charts pearling history from the days of the lugger and hard-hat diving to today’s modern techniques. The Exhibition has been called a time capsule Australia’s pearl coast and it shows the history and the beauty of this “jewel of the sea”. We stopped briefly at the exhibition and would have been happy to have stayed for a while but we had much more to see on this day. Fannie Bay Gaol, not really my cup of tea! 1952. Not that I cared to see them but some people are interested in that sort of thing. The original gaol comprises two blocks of stone cells but in the 1920’s another structure was built to house female prisoners. The gaol discontinued operating in 1979 and today operates as a museum. I must admit, it’s not my cup of tea, so to speak. East Point Reserve is yet another marvellous expanse of grass and trees and walking paths, again overlooking the harbour. It offers a magnificent view of the city skyline and at the Point is the East Point Military Museum, a unique display of World War II memorabilia. This Military Reserve was Darwin’s main defence point during World War II and many of the defences, including gun emplacements, anti-submarine boom nets, lookout towers, and searchlight emplacements still stand today. Set in 1.6 hectares (4 acres) of tropical gardens, the museum is housed in the original concrete command post used by the army in World War II. It’s hard to imagine that this picturesque and tranquil part of our country, overlooking one of the most beautiful harbours in the world, could have been the scene of such terrible destruction. There is a lot of history there, and a lot of ghosts too. On our way out of the Reserve we stopped for a few moments at Lake Alexander. A man-made lake with adjacent picnic area and parks, the lake offers safe, year-round swimming. Absolutely no crocodiles allowed or so the sign says. Frankly I think those things could turn up anywhere, even in your backyard swimming pool! But I must admit the water certainly looked inviting after a hot day . . . just not THAT inviting. this was as close as we would get to Litchfield on this trip and I, for one, was hugely disappointed. 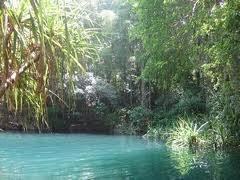 The Berry Springs Nature Park is about 56 kilometres (35 miles) south of Darwin. There are a number of natural springs and rainforest-fringed pools that are open for swimming most of the year. Two of the Top End’s natural wild­life habitats are located in the nature park and there is a walking track that winds its way through both of them. During World War II Berry Springs was part of an R&R camp set up by the armed forces and the ruins of some of the huts can still be seen there. 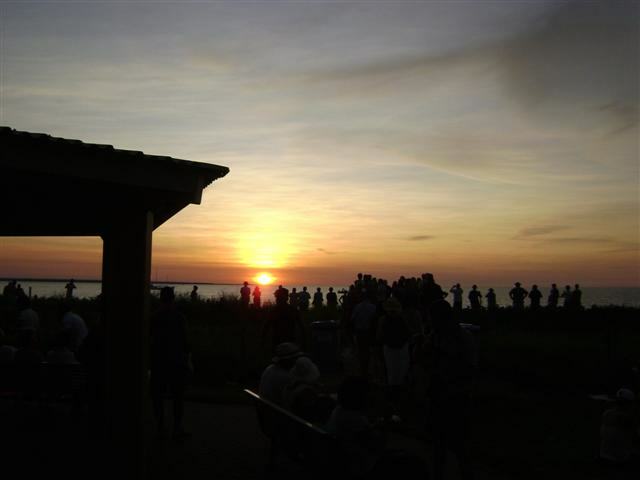 By now the sun had gone down and our stomachs were telling us that it had been a long time since lunch so we headed back to the caravan park and availed ourselves of their restaurant, the Virginia Tavern, for dinner. The food was plentiful and tasty but we didn’t linger; after such a busy day it was all we could do to drag ourselves to our beds and it wasn’t long before we were all well and truly out like the proverbial lights! The next day was another hot day, of course. I think it’s hot the moment the sun comes up! 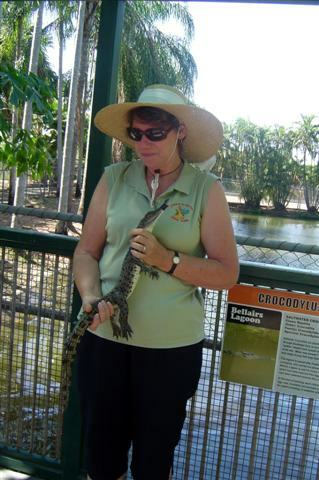 Crocodylus Park and Zoo at Berrimah intrigued us and so this morning we set out to have a look at, and learn a few things about, the croco­diles that inhabit the Top End. 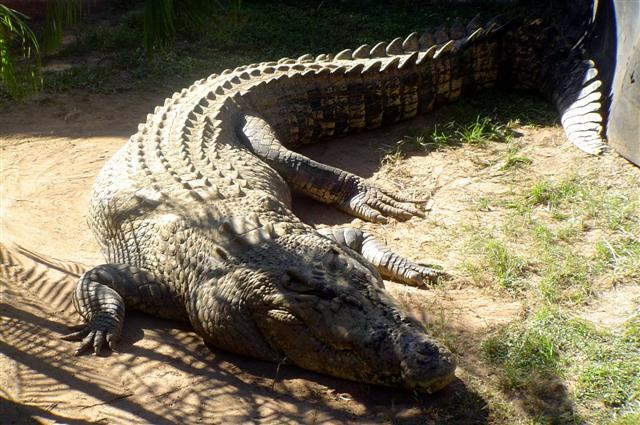 Over 30 years of crocodile research and conservation has gone into this park and it currently has over 10,000 crocodiles from 30 centimetre (1 foot) babies to adults measuring 5 metres (16 feet) and weighing half a ton! the Northern Territory Parks and Wildlife Service tries to prevent crocodiles from breeding in the wild. They even go so far as to collect eggs and hatch them here. They do this to control numbers. At any given time there are, theoretically, only (only!) 75,000 crocodiles in the Top End. Theoretically. They are also bred for commercial use, shoes, purses, belts etc. I must say, the breeding pens were fascinating. Those big male saltwater crocs were in no way reticent when it came to feeding them! Some people in the tour actually got to feed the monsters and it was quite scary seeing those huge males jump right out of the water for a bit of chicken! But it was also funny seeing some of them in trouble with their “wives”, the much smaller female mate, for being on the wrong side of their pen. In spite of the difference in the sizes, the Crocodylus porosus species is most definitely a matriarchal society and the big guys know who the boss is! As it should be. Saltwater croc. Sleeping? I don’t think so! Never smile at a crocodile, never tip your hat and stop to chat a while! Rueben frightened the life out of us when he climbed into the pen with the big fella, known affectionately as Eric and almost tame – well, as tame as a saltwater croc can be! But he explained to us that this old fellow wasn’t about to attack him. Too old and too well fed, I’d say, It was the croc in the next pen who wanted to jump over the fence and have himself a Rueben sandwich (pun intended). When Rueben finally left the pen, he led us along past the American alligators and the freshwater crocodiles to the raising pens. Literally hundreds of young “salties” were crammed into these pens and they didn’t seem to mind that they were lying on top of each other, all blissfully unaware that they were destined to become handbags, shoes, and belts. Do we have an understanding here? taped shut for our protection; we didn’t need to be snapped at by 60 razor-sharp teeth. At first I was reluctant in the extreme to even touch one of these things but once the creature and I had come to an understanding everything was fine. He simply needed to be made aware of the fact that he may not yet be big enough to be a pair of shoes but he’d make a neat purse! The tour over, we took the time to walk through the zoo. 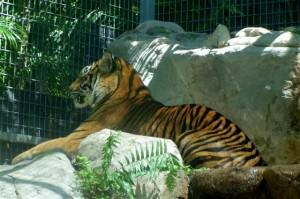 There are animals here from all over the world – lions, tigers, monkeys etc. 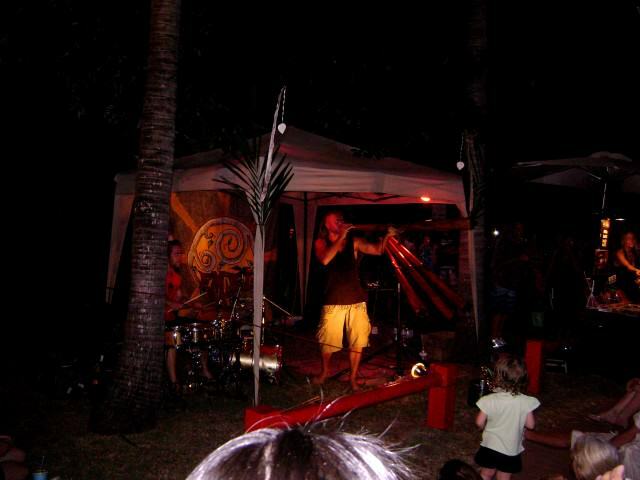 – as well as native animals. The Zoo is now home to Sabre, a Bengal Tiger, who is the mascot of the 5th Battalion, Royal Australian Regiment. Born in 1992, he is 110 kilograms (295 pounds) of very proud beast. bay, protected from Darwin’s fluctuating 8 metre (26 foot) tides by a double-action lock. Only minutes from the Wharf Precinct, Cullen Bay has a much more tranquil feeling and we strolled along the boardwalk, debating whether or not to take a scenic cruise out into the harbour. It’s the only way to truly appreciate the beauty of the tropical coast. As luck would have it, today’s cruises were totally booked out and so we settled for a light lunch before returning to camp to spend the afternoon relaxing by the pool. so I opted out of that excursion. But John and our travelling companion, Robert, were both adamant that they needed to catch a barramundi and so off they went with King Kontis Fishing Charters. 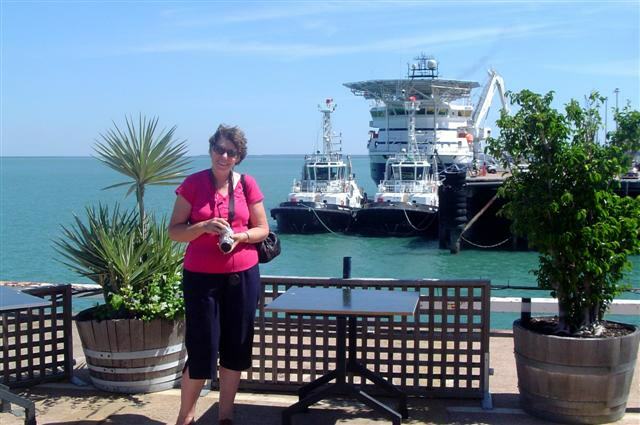 The half-day charter in Darwin Harbour visits various reefs and wrecks, including Middle Reef, Fish Reef, and Charles Point. I’m not exactly sure where they went and neither are they except that it was about 5 kilometres out from the marina. 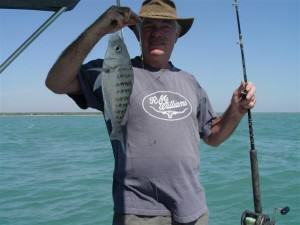 the fish they call the grunter. Now I’m not sure if they call it that because it makes a grunting sound or if that’s the sound you make when you’re trying to land the thing; I believe it puts up one heck of a fight. some with their folding chairs, to settle down and watch one of nature’s most glorious displays. The only problem was that it was over way too quickly. Once that sun dipped below the horizon, the darkness settled over us like a shroud. Oh, but then the stars came out. It was a truly beautiful evening. 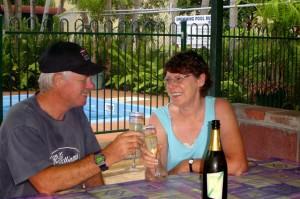 We left not long after that and made our way back to the caravan park where we headed for the pool. We were hot and sticky and a swim was the perfect end to the day. The next day would be our last in Darwin until our next visit and it was a lively discussion beside the pool as to what we would see and do on said last day. 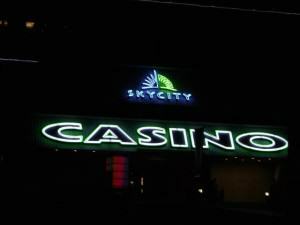 Of course, a visit to the casino was a must and, finally, with our plans made we returned to our van and settled in for the night. Commission in 1979 but unfortunately, the big beast became tangled in a log and drowned while being transported. Its body is now mounted on permanent display in the museum. 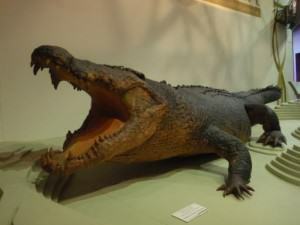 Just looking at those very well preserved teeth and the powerful jaws is enough to give you chills. 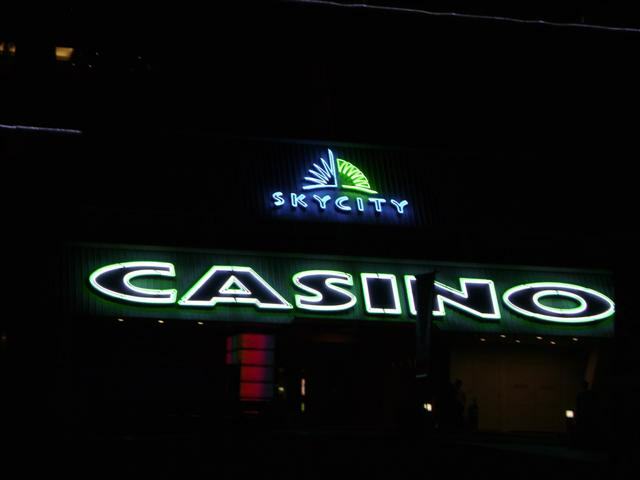 The end of our visit had come but there was still one place left to see and that night we went to Skycity where we enjoyed a superb dinner in the restaurant and afterwards spent a little time in the casino, finally leaving a little after 10:00 with our wallets considerably lighter than when we’d arrived. But we had had fun, and isn’t that what it’s all about? 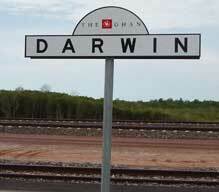 It was still hot and I couldn’t leave Darwin without one more swim in that fantastic pool at the caravan park. We had the pool all to ourselves and stayed for a little over 30 minutes before reluctantly towelling off and making our way back to camp. There was much that we didn’t get to see and do in our short stay here but there’s always next time!